Street artists to their core, Patrick McNeil and Patrick Miller make up FAILE, an artistic collaborative whose kinetic, image-saturated paintings, prints, sculptures, and installations have been enlivening public spaces and city and gallery walls since the turn of the 21st century. Though they are busy with exhibitions and public commissions across America and abroad, they remain focused on the street, where their work first appeared as stickers, posters, and stenciled images. 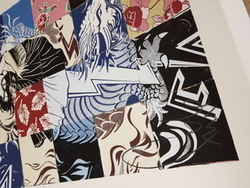 Democratic and urban, FAILE is influenced by manga and the rhythm of city life, as evidenced by the mash-up of comic book and cartoon characters, advertising and propaganda slogans, bright patterns and colors, and historical and pop cultural references animating their work.